Howdo, long time no blogging for me. I've played Lizardmen for a long time, so my skinks are old warhammer models with the weapons removed (the quivers are filled with rocks to slow them down so the elves can catch them). The Sauri (Saurusesesss?) are a new addition found in a bits box at the local fgs (Worcester Wargames), they're Salamanders from Mantics Kings of War range, the scale is good against the new GW minis as the old Sauri are only human sized however I may have to find a new Kroxigor. Cheers and remember the ball! Doc here with a showcase of my completed converted Tomb Kings / Khemri team. They are all converted from the old GW range now out of production. I will say this was a fun little project and I decided to complete a full 16 player roster (ever hopeful that I might get to that number). So what do you reckon of the team comments are always welcome the base names have caused a split opinion amongst the code40k players what do you reckon needed or not? Bluddtoof here with an update on my blood bowl painting progress. I've put the orcs on the back burner until GW release a Troll, gobbos and the orc team box; I want the official figures for that team. The Dwarves are a perfectly playable team straight out of the box so I've moved on to them for now. BEARDS!!! I'll say it again... BEARDS!!! I love em! Even the troll slayers ridiculously huge trailing monstrosities which appear to have been possessed by some form of magical spell from an errant side line wizard and are now capable of propelling themselves and the troll slayer down the pitch!! I understand why a lot of people don't like em but I do and there's been plenty of hate for em in the web community so nuf said I think. The rest of the teams beards are probably the best bit of the sculpts in my opinion, really nicely done and good to paint. As for the rest of the models (and this goes for all the new bb stuff I've bought so far) the sculpts are generally nice, not up to GW's usual high standard, but good nonetheless, with a few minor exceptions; around the feet they often lose distinction making it hard to see where shoe, sock and pants start and end. Also on one of the dwarf blockers, the head and shoulder don't quite match where the right shoulder pad is concerned and some of the head/hair connections are a bit ropey. Considering that this is a nice introduction game for new customers and the figures are designed to be push fit and the price is significantly less for a team box than for a typical 40k troop choice box with equivalent model count, then I don't really have any serious complaints. And I'm enjoying painting em! The bases are just GW textured paint; astrogranite, with black wash and lots of dry brushing, they'll be finished off with some patchy snow and blood stains and the team will get a little weathering. I've also got a plan for a modelled dugout including beer barrel counters and a bar full of cheerleaders and assistant coaches! Pleased so far with these and not a huge amount left to do, as ever c & c welcome. 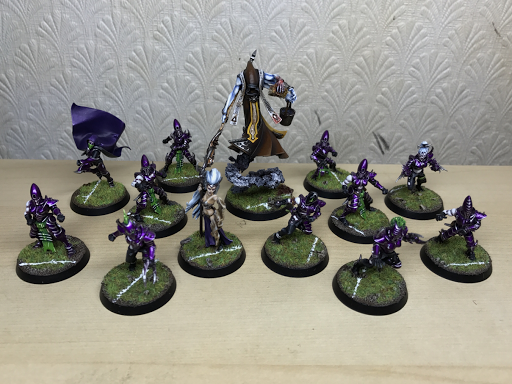 Hey guys and girls - Bristles here with a quick update on what's been going on in my hobby world recently. 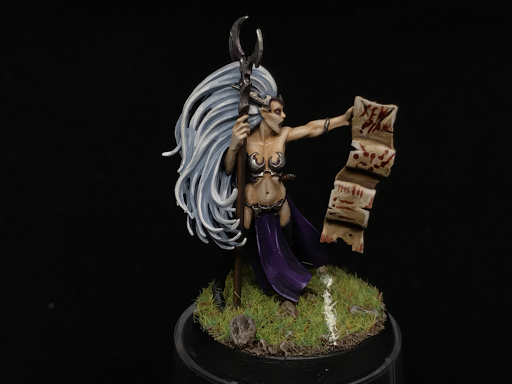 With my Dark Elf Core Team pretty much all finished I wanted to have a shot at doing some of the other models to represent my manager, apothecary etc so I began scouting around for suitable models. 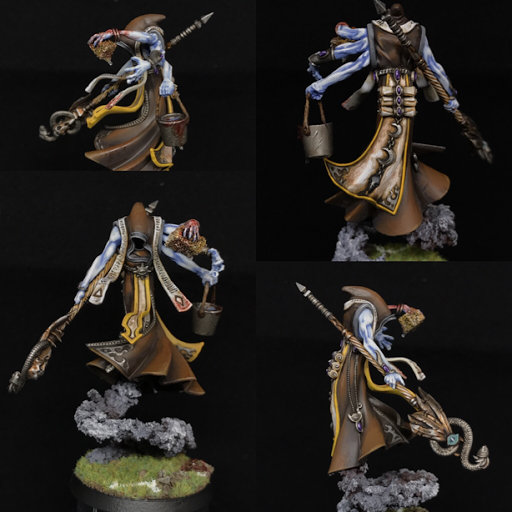 The model is 'The Changling' from the AOS range but I replaced the plastic smoke with a slightly different effect after getting advice from Boss Bluddtoof and Inner Mech and how to go about it. Tbh I'm damn proud of how it's turned out and think he is one of my best, certainly one of my most enjoyable little projects.